The Wright Wreport: MBFW Day 1 More Shots: Has It Really Been 30, Kenneth? MBFW Day 1 More Shots: Has It Really Been 30, Kenneth? HEAD’S UP: That turnaround between September and February always seems short. One is in the middle of the Yuletide season when the notice arrives about registering for Mercedes-Benz Fashion Week New York! 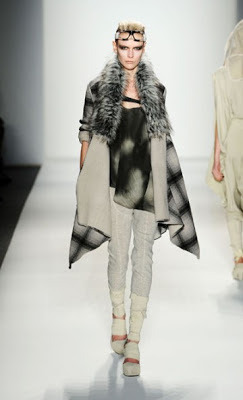 Well, here we are at Fall 2013 and a small change in the VEVLYN’S PEN approach to covering Fashion Week. We will still put emphasis on the truly inspirational on the runway and will only do a “best of” when it suits. We will also continue to endeavor to provide a roundup of the best, worst and most interesting Yours Truly (and others) witnesses, from trends to sightings to the rather unusual/bizarre. Now, for the changes. On some days we will provide a “snapshot” as we did yesterday (http://www.vevlynspen.com/2013/02/mbfw-day-1-snapshot-todd-snyders.html). We will also comment on particular pieces from a collection that capture our imagination. Finally, at VEVLYN’S PEN, coverage may take the form of photos with comments underneath, including whether the picture subject tends toward a trend. How’s that? OK, off we go! THE first day of Mercedes-Benz Fashion Week is now history. Yesterday at the tents it seemed that the assembly was holding its collective breath. Why? Not sure. Incidentally, it was very quiet in the lobby area of the tents. Must be the layout. The various sponsors are cubbyholed. Yours Truly thinks it intimate, but a wag with whom I was jawing, derisively compared it to an airport hangar or a room at the Javits Center (http://www.javitscenter.com). Oh, well. All was sort of quiet on the runways and other model venues, too. The biggest talk was about Kenneth Cole. The designer was to show in the tents but that didn’t come off, because his people and IMG (http://www.imgworld.com), the company that runs MBFW were not on the same page. That I can assert with confidence; the rest … well. Anywho, the designer returns to celebrate the 30th anniversary of his line. Wow, time flies. Is she too chill for the Arctic? Photo from Mercedes-Benz Fashion Week. One imagines the men and women got up in Kenneth Cole making their way to their offices in Soho or some other really cool corner in the city. The fabrics are lush, rich and look very expensive. However, they are not. This is Kenneth Cole after all – accessible. It’s a collection to be proud of – worthy of 30. It is self-confident, self-possessed and very serviceable. And oh, KC has always been one on the right side of a cause. He’s doing a lot of work with amfAR these days. Any tweets with the hashtag #kcrunway inspire the designer to donate $1 to amfAR, The Foundation for AIDS Research (http://www.amfar.org/). Pretty in pink and sequins at Candela. Photo by Yours Truly. Elsewhere on Day 1, starter Nicholas K has on the brain the Arctic. If nothing else, one is layered for the odyssey. At Candela, perhaps an homage to fatherhood: “To when the name of father was another name for love.” ??? Visit http://www.mbfashionweek.com to learn more about Mercedes-Benz Fashion Week, including show information and videos.